Dozens wait in line during the wee hours Friday for the Apple Store at the Maine Mall to open. SOUTH PORTLAND — About 100 Mainers lined up early Friday outside the Apple Store at the Maine Mall to be among the first to get their hands on one of the new iPhone 5 models. Apple debuted two new versions of its popular smart phone: the 5s, with enhanced features, and the 5c, a colorful, lower-priced model. 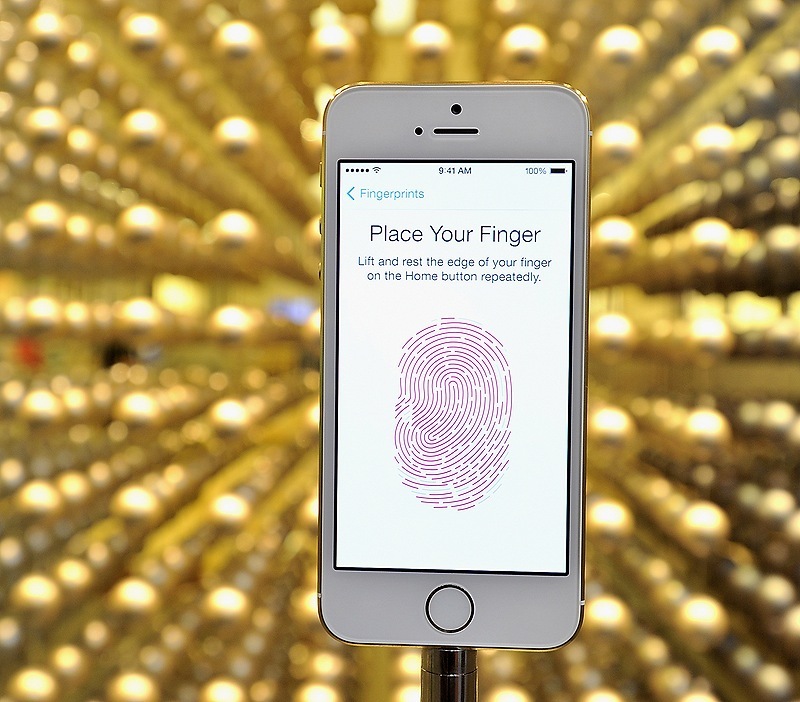 The new Gold iPhone has fingerprint security. Apple Store leader Pam Famous greets Dan Kennedy of South Portland, who had waited since 3 a.m. Friday for a chance to buy a gold iPhone 5s. First in line was Dan Kennedy, 44, who said he had arrived at the mall at 3 a.m.
Kennedy, a pressman for the Portland Press Herald, was one of just two people at the Maine Mall location who received tickets entitling them to the coveted gold iPhone 5s. “I’ve got a golden ticket,” Kennedy said. The South Portland resident said he has never before come to the mall in the wee hours to purchase a product. Because Apple had warned consumers that it had only a limited supply of the new phones, Kennedy said, he decided it was worth it to come early so he wouldn’t miss out. “I didn’t think I’d be first,” he said. The majority of those who arrived early to buy one of the phones were men in their 30s and 40s. Portland resident Matthew Baker, 30, said he arrived at the mall around midnight but there was no one else there. He waited in his car until he saw Kennedy standing outside the designated mall entrance for the iPhone queue. Baker ended up being second in line and was the only other shopper at the mall to receive a gold iPhone 5s. “I would have taken another color if they didn’t have the gold, but that’s what I wanted,” he said. Kennedy said other people in line offered him and Baker money to trade iPhones, but both declined. 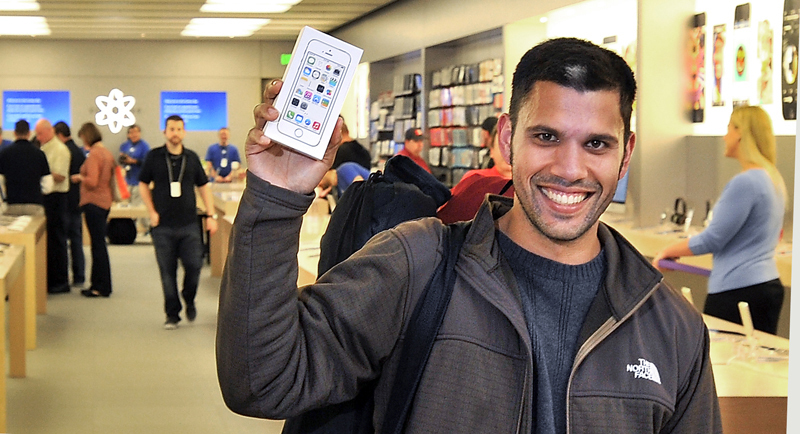 Gold iPhones 5s were selling on eBay Friday morning for as much as $1,000. A note on Apple’s website informed shoppers Friday that gold iPhones would not ship until October because demand for the color has outstripped supply. The Wall Street Journal reported Thursday that Apple has asked its suppliers to step up production of gold-colored phones. Apple had about two dozen employees at Maine Mall on Friday for the product launch. Customers were lined up in a roped-off queue and were allowed into the store in small groups after it opened early at 8 a.m.
South Portland police and mall security guards were on hand, but Apple staff managed the crowd with perfect precision. Apple launched the new iPhone models Friday in the U.S., Australia, Canada, China, France, Germany, Hong Kong, Japan, Puerto Rico, Singapore and Britain. The 5, which ranges from $200 to $400, comes in silver, gold and “space gray.” It contains the Apple-designed A7 64-bit system-on-a-chip, a new 8-megapixel camera with a color-preserving flash, and a fingerprint scanner for security. The 5c, which ranges from $100 to $200, is a modified version of the original iPhone 5. Unlike the original’s metal casing, the 5c’s outer shell is made of high-grade plastic and is available in white, blue, red and yellow. Both phones come with a new front-facing high-definition camera, more robust 4G LTE wireless capabilities and Apple’s new mobile operating system, called iOS 7. Customers can trade in their existing iPhones to receive a discount of up to $200 on one of the new phones or any other product in the Apple store. In the U.S., the new iPhones are available through Apple, AT&T, Sprint, T-Mobile, Verizon Wireless, Best Buy, RadioShack, Target and Walmart stores. Apple debuted the original iPhone 5 in September 2012, selling more than 5 million units in the first three days. The company has warned consumers that supplies of the new phones would be limited at first. Those unable to find one in stock can order a phone on the company website, apple.com. Employees at the Maine Mall Apple Store said they didn’t know how many iPhones 5s and 5c would be left in stock Friday or when the store would be receiving more. Not everyone at the mall Friday morning was there to purchase a new phone. Dinara Magdieva, 26, said she was only in line to accompany a friend who was hoping to buy one of the new phones. The New York resident said she thought it was too soon for her to upgrade, since she had purchased the iPhone 5 just a year ago.